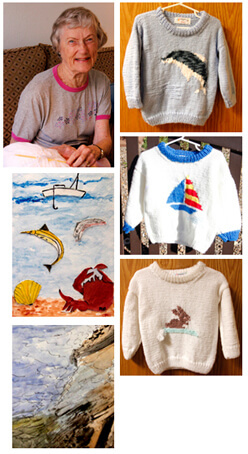 “I love knitting children’s sweaters, in sizes six-months to six-years, and have been selling them in the Gift Shop since 1993. It’s fun to use creative patterns such as my sailboat, dolphin, rabbit and snow flakes and I especially enjoy getting ready for holidays with red and white star sweaters. Acrylic yarn is the favorite for moms to wash. Ideally, my sweaters make great shower gifts, and for birthdays and holiday fun. “In 1997 I attended an Elderhaus week in Tennessee and began my career in watercolor painting and oil painting. From this experience, I created my own cards for personal notes and Christmas greetings. I decided to make them to sell in the Gift Shop this year. I use watercolor cards to paint on and customers like them for framing.